"Helpful friendly and efficient "
Joining Jack is a charity based in Wigan founded by Andy and Alex Johnson after they received the devastating news that their son Jack had Duchenne Muscular Dystrophy, of which there is currently no cure. Jack’s parents now dedicate their lives to raising money for research into finding a cure for the terminal condition. DMD is a ravaging muscle wasting-disease and usually appears in boys before the age of 5 and by the age of 12 most patients are confined to a wheelchair. The disease will lead to paralysis and intense breathing difficulties. 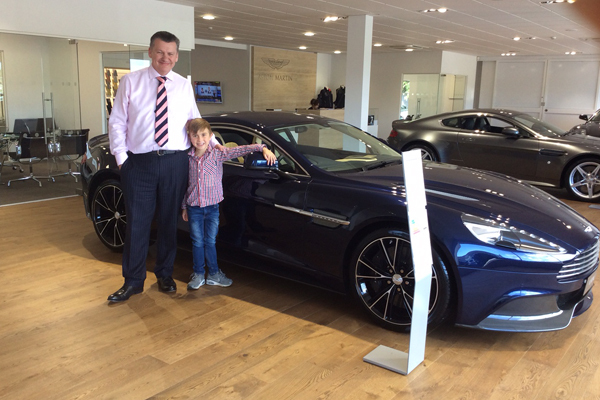 Cambria Automobiles CEO, Mark Lavery, was lucky to meet with Jack and his parents recently at our Grange Aston Martin dealership in Birmingham to discuss how we can help support their mobility needs whilst looking after Jack and raising money for the research. Jack is a bubbly and vibrant young man who is very positive in his outlook and it was a real privilege to meet him. He had great fun sitting in and revving the Aston Martin range and went on a special test drive in a DB11 with Dean Sprag our Aston Martin Transaction Manager. Jack’s Dad Andy Johnson is a former Rugby League star who signed for his home club Wigan Warriors at the age of 17 and went on to play close to a 100 first team games. Through Andy’s sporting connections, the Charity has many sports and TV personalities as Ambassadors including Grange Ambassador Jason Robinson, Owen Farrell, Andy Farrell, Kris Radlinski, Danny Orr, Actress Lucy-Jo Hudson and we are delighted to announce that Cambria is also Joining Jack by providing a car that can accommodate Jack’s Wheelchair. Andy and Alex are doing everything they can to help Jack and other children like him and we are thrilled to be able to support them and the charity in their quest.